Another cargo aircraft has been renamed by LH cargo in line with its policy of giving their freighters names of countries served by the LH Cargo group. The christening ceremony, where the aircraft was greeted with the classic water salute from the airport’s fire brigade, was held at Cairo International Airport and attended by the Egyptian Director of Civil Aviation, Mr Hani Al-Adawy alongside the German Ambassador to Egypt, Mr Julius Georg Luy. 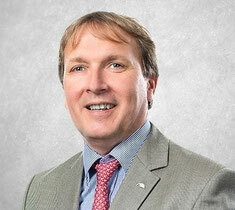 Lufthansa’s Management was represented by Soeren Stark, LH Cargo’s board member for Operations. Naming another of their freighters under the name “Marhaba Egypt“ is meant to underline the importance of the Egyptian cargo market for Lufthansa Cargo as well as the good relations between both countries. This is now the eleventh cargo aircraft which has been renamed. The Dubai based carrier started a weekly Boeing 777 freighter service between Dubai and Oslo as from October 11th. 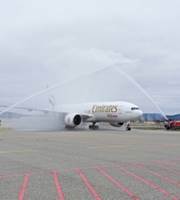 This is Emirates first all cargo service to the Norwegian capital, although it offers up to 175 tons of belly capacity on the route each week with its five B777 passenger services. The B777F can carry just over 100 tons per flight and is according to Emirate SkyCargo managers an ideal aircraft for the carriage of the increasing seafood products, particularly salmon, from Norway. Exports of seafood from Norway have doubled during the past six years and Emirates has 15.000 square meters of temperature controlled facilities in Dubai where such commodities can be safely handled when in transit there. AirBridgeCargo&apos;s former Senior VP Marketing & Sales, Dutch national Robert van de Weg has been promoted to the post of Senior VP Sales & Marketing at Volga-Dnepr Group. In his new position, the manager is responsible for both the Group&apos;s scheduled Cargo operations and carter activities, namely AirBridgeCargo, Volga-Dnepr Airlines and Atran Airlines. The three carriers operate a combined fleet of 16 Boeing 747Fs, 12 AN-124s and 5 IL76-TD-90VDs. V-D Group&apos;s President Alexey Isaykin commented: "Robert is a highly respected air Cargo executive both with our customers and in the wider industry." Since joining ABC in 2014, "he has made a valuable contribution to the success of AirBridgeCargo and we expect this to continue in his new role." 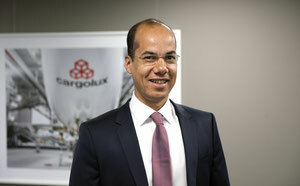 German national Christoph Michael Bannerman has joined the Luxembourg based all cargo carrier Cargolux as its new Vice President for Corporate Development & Strategy. Mr Bannerman had previously spent many years with Lufthansa in various management positions before joining the Hong Kong based courier company, Select Courier, in 2013. He held the position of General Manager there before deciding to take up the CV position as successor to Maxim Strauss who was recently promoted to Executive VP and Chief Financial Officer. Bannerman brings quite some airline experience with him from his many years at Lufthansa, among others in the Strategic Alliances & Marketing Department as well as having served in Singapore as Manager Sales Steering and Marketing Asia Pacific for the German carrier. Germany’s largest airport operator, Fraport, recently published its figures for the first nine months of this year. Passenger figures declined in this period by 1.2 percent to 46.7 million passengers handled compared to 2015. This despite having achieved a new September passenger handling figure. The number of passengers handled rose to 5.9 million in September. In contrast, cargo tonnages rose in total by 5.9% in September and for the first nine months a 1.3% rise to just under 1.6 million metric tons was recorded. Total aircraft movement declined in the period by 1.4%, some of which can be attributed to flight cancellations due to strike action. Fraport’s international airport portfolio continues to show mixed results. with Antalya airport in Turkey and Russia’s St. Petersburg having lower passenger figures compared to the year before. The Belgian and Luxembourg Aviation Press Club (APC) has awarded the Brussels Airport Company CEO, Arnaud Feist with its annual ‘Man of the Year’ award at a ceremony held recently at Brussels Airport. 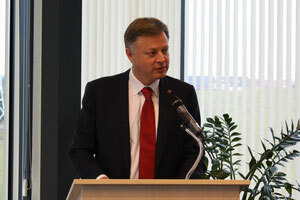 The award was presented for his efforts in promoting Brussels Airport during its 2015 evolution as well as for his excellent relationship with journalists. The cargo volume at BRU International has grown by 8% so far this year. Mr Feist has dedicated the award to the entire airport staff that he says has outperformed to make Brussels Airport better and stronger after the March 22 attacks.